What Does the West Expect from the Next Ukrainian President? – Центр "Нова Європа"
Home - Research - What Does the West Expect from the Next Ukrainian President? Ukraine’s presidential election season is in full swing, being unpredictable and tense. Whoever becomes a President, he will have to deal with a whole range of challenges, including the Russian-Ukrainian conflict settlement and promoting the reforms implementation. Therefore, it is very important to understand what other states expect from the future Ukrainian President. This may influence the support of Ukraine on the international arena. With this in mind, the New Europe Center contacted well-known foreign researchers with the following question: What changes do you expect the future President of Ukraine to make both in domestic and foreign policy? You can read the argumentation of the following experts in our new policy commentary: Stefan Wolff, Professor of International Security at University of Birmingham, UK; Edward Lucas, Senior Vice President at the Center for European Policy Analysis (CEPA), USA; Céline Marangé, Research Fellow, Institute for Strategic Research (IRSEM), France; Constanze Aka, Senior Project Manager, Research Associate, Institute for European Politics (IEP), Germany; Martin Stein, Senior Project Manager, Research Associate, Institute for European Politics (IEP), Germany; Cristina Gherasimov, Research Fellow, Robert Bosch Center for Central and Eastern Europe, Russia, and Central Asia, German Council on Foreign Relations (DGAP), Germany. The paper was written within the Think Tank Development Initiative for Ukraine (TTDI), carried out by the International Renaissance Foundation in partnership with the Think Tank Fund of the Open Society Initiative for Europe (OSIFE) with financial support of the Embassy of Sweden in Ukraine. 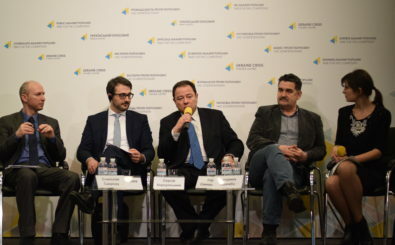 The views and opinions expressed in this paper are those of the author and do not necessarily reflect the position of the Embassy of Sweden in Ukraine, the International Renaissance Foundation, and the Open Society Initiative for Europe (OSIFE).